The latest details of Intel’s Coffee Lake 8th generation family have leaked out over at PCEVA. The new details give an insight into various features of the 300-series platform which will support Intel’s 8th generation Core processors. 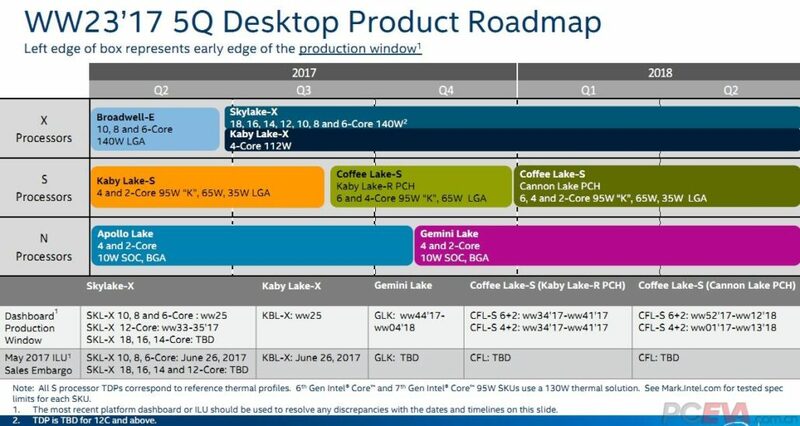 The details start off with a desktop product roadmap which show that Intel plans to launch their Coffee Lake S series processors in late Q3 2017. 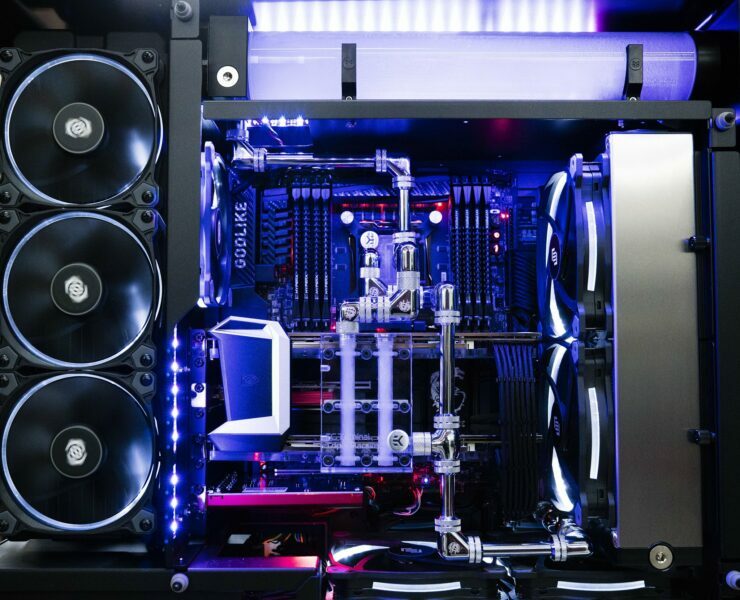 The ‘S’ moniker stands for mainstream desktop chips which are going to launch on the 300-series platform. 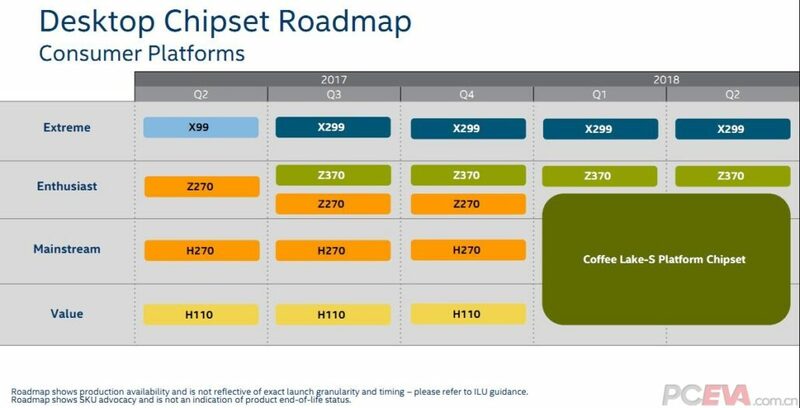 The roadmap shows that Intel will be making two product updates with the Coffee Lake S family. The first family will be arriving on the Kaby Lake refresh chipset which will be known as Z370 and the second family will be arriving on the Cannon Lake PCH which will be known as Z390 and will also include other SKUs (H/B/Q). 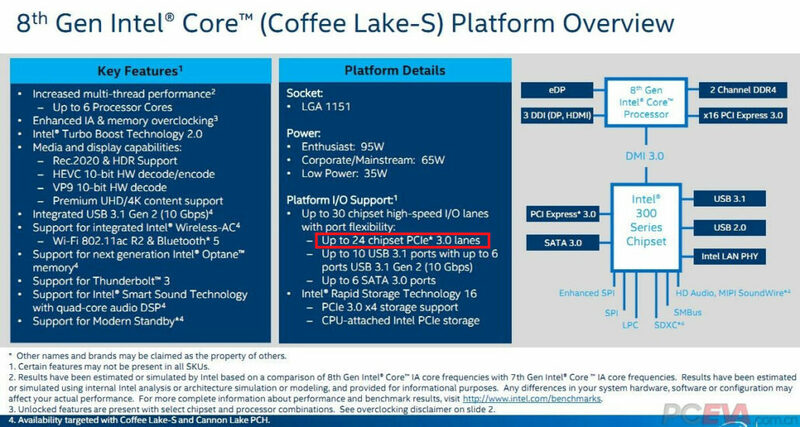 Now the most interesting part which we don’t know as of yet, is whether Intel is only referring to a chipset update with Cannon Lake (PCH) or they are planning to do a refresh of Coffee Lake S chips as early as Q1. It can be seen that Coffee Lake S 6+2 (6 Core / GT2) and 4+2 (4 Core / GT2) will have a production window between the 34th and 41st week of 2017 which means we are looking at a launch planned around August – October. Now, we are also looking at another lineup that is going to be produced between the 52nd week of 2017 and the 12th week of 2018. We are looking at the same SKU configurations (6+2, 4+2, 2+2) but the difference is that they are months apart from the initial core lineup that launches this year. 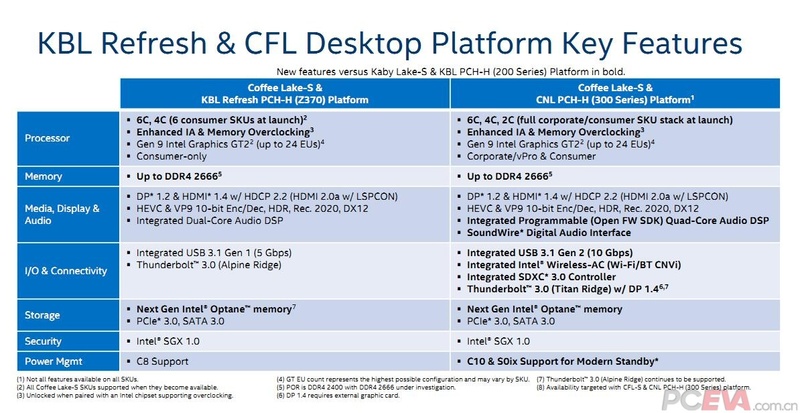 It can only mean one of two things, either this is the chipset specific launch or Intel plans to refresh the entire desktop family within months of launch when they launch the Cannon Lake PCH. This will mean that we are looking forward to at least two generations of CPU support on the 300-series platform. The Intel desktop chipset roadmap is also an interesting one. It shows that Intel will be launching Z370 motherboards in Q3. This could mean as early as August and as late as September which is just a month away. The second part is more interesting as it shows the Coffee Lake-S platform chipset. This could be referring to the Cannonlake PCH which we were talking about earlier and the date inclines with it too. What’s interesting is that the Coffee Lake-S platform chipset covers all segments such as Value, Mainstream and Enthusiast. So it means that while we will get a new chipset replacing H270, B110 and H110, the enthusiast Z370 will also be replaced by a new variant. This might be referring to the new Z390 chipset that has been doing the rounds in the rumor mill for a while now. One key detail mentioned in the leak is something I was talking about a few hours ago in my previous article. This is related to socket support and Intel has kind of confirmed the previous information in their own slides. The Coffee Lake chips will be supported on the LGA 1151 socket but they won’t be compatible with 100-series or 200-series motherboards. You can find more details over here on this topic. The Intel Coffee Lake lineup will be a very decent option that goes up against Ryzen processors that AMD has out as of right now. Arriving in two months, the Coffee Lake processors will provide users with formidable levels of competition against AMD’s offerings.